Has anyone else noticed the price of rice lately? Like everything else, it is going up in price. Rice is still a frugal thing to cook but not as frugal as it used to be. We eat a lot of rice. My husband really enjoys rice. He will eat the brown rice but he prefers me to fix the white rice. I like the flavor of brown rice, I prefer it over white rice. But I cook mainly to please my husband so white rice is usually what we eat. We do enjoy some of the more specialty rices. We like Jasmine, short grain, and occasionally sweet rice. Those varieties are what tend to be more expensive though. When we were first married and my husband was in college, money was tight, very tight. There was an Asian type market not far from the apartment we lived in. I discovered that rice was much cheaper at this store then the regular grocery stores. You could also get the speciality rices for a good price. You had to buy in bulk in order to get the best deals but we did not mind. I would buy ten pounds or so and then store it in airtight containers. Actually, we were eating so much rice ten pounds did not last long. One of our very frugal meals was soft boiled eggs over rice with a little soy sauce on top. Not fancy but very cheap (short grain rice works best for this). When we moved to where we live now, I got away from shopping at an Asian market. Mainly for convenience. There was not one very close or in an area I go to very often, but with the price of rice going up so much I decided to try it out again. I am glad I did. We went last week to see what we could find. I had to buy in bulk to get the best deal but again I did not mind. We now have three kids so we will use it up. I bought a 25# bag of Jasmine Rice for 17.99 and a 5# bag of brown rice for $4.99. This is a good deal in my part of the country. Prices may vary where you are. You may be able to find better deals. I filled up jars with the rice and placed the rest in the freezer. I do this because I have the freezer space and it also helps the brown rice to last longer. 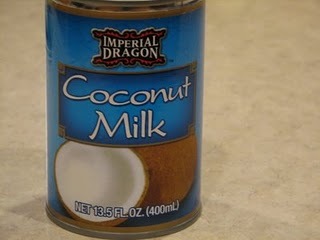 The other thing I found was this coconut milk. We use it to make Jasmine Rice for breakfast. I usually pay $1.40 at Wal-mart. At the Asian store I got two different brands to try. One was $0.89 and the other was $1.09. So the coconut milk alone saved me money. I saw all kinds of soy sauces and other special seasonings but I tried to stay focused on what I came to the store for. Next time I am going to compare prices a little more. We also like going to the Mexican supermarket to get hot sauces and salsas. My husband loves spicy dishes. The hotter the better. He puts hot sauce on just about anything. We have found the Mexican stores to have good prices on these items. They also carry ones that you cannot find at your normal store. So my frugal tip is check out your Asian and Mexican markets. You may be able to save some money. For more frugal ideas see Frugal Fridays.